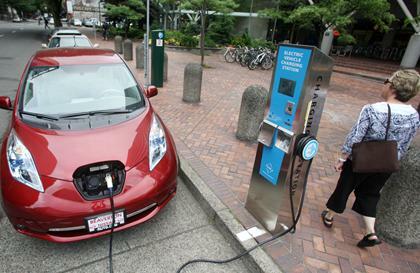 Nissan and General Electric are partnering to research ways for electric vehicles such as Nissan's Leaf to connect with homes and electric grids, the companies said Friday. The research could lead to a way to use the Leaf's lithium-ion battery as a backup for a home power outage, said Bob Sump, vice president of Nissan's Farmington Hills engineering center. In addition, the partners are exploring ways to incorporate the Leaf into GE's Smart Home concept, which uses its Brillion technology to allow appliances to "talk" with a system that monitors home energy use. Smart appliances can use energy when it's least expensive and least taxing on the local electrical grid. GE makes its own electric-vehicle charger, called the WattStation, but that isn't part of the partnership, said Mark Little, GE's global research director. Nissan has so far sold more than 15,000 Leaf pure electrics worldwide and imported and sold more than 7,000 in seven U.S. markets. By the end of 2012, Nissan plans to build the car in Tennessee and sell it nationwide. To compare, General Motors had sold 3,498 Chevrolet Volt extended-range electrics through August, although GM built 7,520 Volts in Detroit-Hamtramck in that period. Car's BOOSTED.....with a LEAF BLOWER and NAWZ!